I picked up this jacket at GoodWill last month. It had three holes in the sleeve, but I thought it might be worth trying to repair because of the brand. I've now started the repair, and think that with some careful attention, it'll be a success. But before I put in the time to finish, I thought I'd ask - is it worth the effort? Worn here over a shirt and a shell. I'd most likely wear it over something of similar weight and thickness. 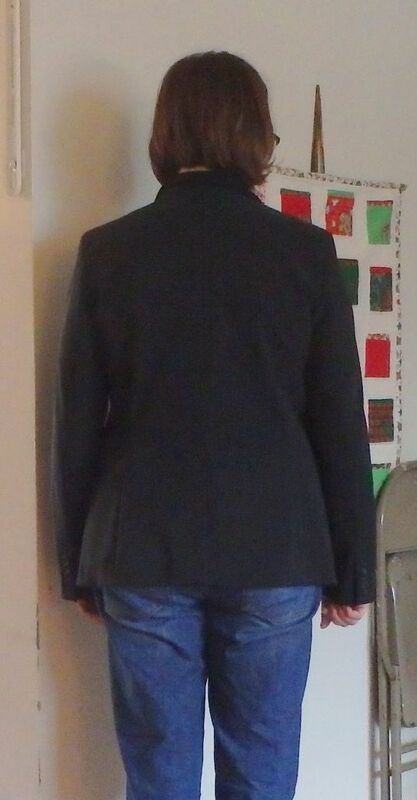 #1 from the side, buttoned. The three (partially repaired) holes are on this sleeve. Thanks for your help and thoughts on this potential project! I'm no good at judging whether things are dated. However, to my eye, this is a very 'business suiting' looking blazer. So how do envision wearing it if you did the repairs? Because I'm not sure it's the right one to mix with more casual pieces, at least like you've shown here. It seems to cry out for a similar suiting-esque bottom, or at least something in a more formal register. I think it fits you well, so on that basis worth the repair. What about if you wore it with untucked shirttails, jacket sleeves pushed or rolled up to expose the shirt cuffs, and the jacket collar turned up in back? That might give it a more casual vibe. Because I sew a lot, I might consider shortening the hem, too. But that is a bigger job, and maybe you would have problems with the pockets, too. I would think its not worth the effort to repair unless you really love it. It's not silk lined. And it's a good brand but not a designer item. If it was an Italian made piece and silk lined I'd think differently. I think you can find something similar without flaws at a thrift store. I'm actually surprised they are selling you an item with wholes in it. Sorry. ETA. I see it is silk lined but the outer is polyester. The silk lining is a nice thing but I still don't feel it's worth it. Yeah - I knew it was a risk buying it :) If it hadn't been 99 cents, I wouldn't have. But I feel like I've gotten my dollar out of it just admiring the handiwork (hand-stitched 5 layer shoulders, for example). I don't feel like I'm disappointed to not fix it completely and wear it. I'll just admire the workmanship and let it go. Thanks! 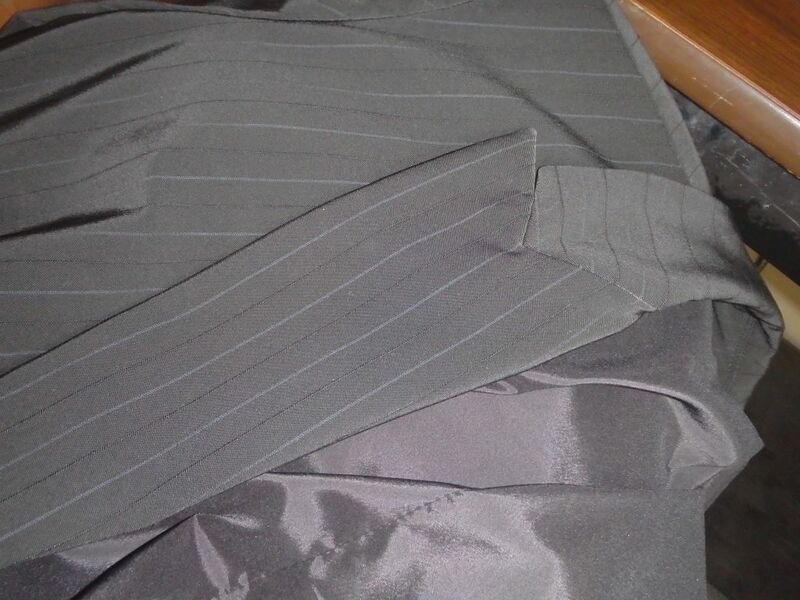 Ad I feel I got my money's worth because I learned a new term (peaked lapel). ;) I'm sooooo bad with suiting, I can't tell what's dated vs classic, I don't understand the code (what makes something formal, etc). Luckily I never have to wear it :) However I had the same gut reaction as others - looks like half a suit, not something to work into your casual wardrobe. I'd like to see it with Barbaraq's suggestions - pushed up sleeves, notched collar, shirt-tails hanging below the bottom of blazer. Do you have any "track" pants or really slouchy BF jeans? I'd try it with those also. I wouldn't ever wear it buttoned up - just too conservative that way. How about with a chambray shirt? I'll give those a try Marley - thanks! I could make use of a jacket like this but I am (harruph!) older than you are by decades. I see the attraction--I love Tahari, but not every Tahari piece I've bought has worked. Some things bought on sale have had a short life inside my closet. What a price! I'd be tempted to try working with it. What is your time worth, though? That is the question I have to ask myself when I get such a great bargain. Whether you keep the jacket or not, I was struck by how nice you look in a blazer, Amy. I think it's worthwhile keeping an eye out for a wool blazer in a herringbone or tweed--something that will pair more effortlessly with your jeans and casual looks to give them a little bit of a dressy vibe when you want it. I quite like the wide pinstripes. They are a bit of the gangsta look which appeals to me. I think if you rolled the sleeves and put it over a casual t-shirt with BF jeans, it might work. What Firecracker said. I think you could rock the sporty equestrian look. Nice jacket, and I agree that it fits you remarkably well. YMMV, but I used to thrift/buy cheaply this kind of jacket and just never found a satisfactory way to wear it except for special occasions. The combination of the suiting fabric and the sober coloring made it tricky for me to casualize it in a way that looked authentic and not just "I was cold and threw on my office jacket over my casual outfit". 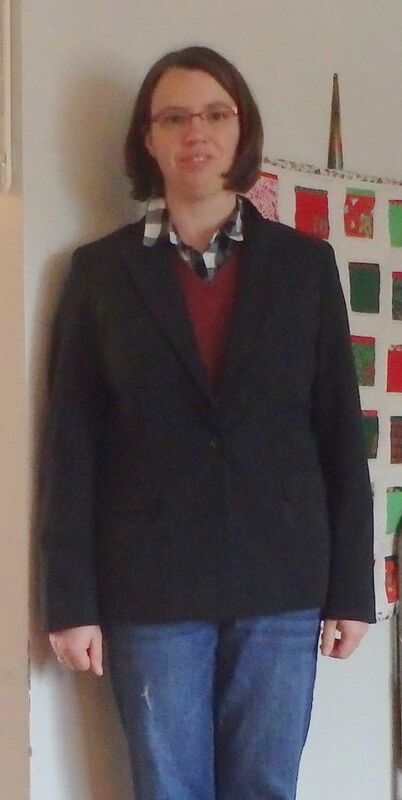 I've resigned myself to only buying blazers in more casual fabrics (ponte knit etc.) or in brighter colors or in prints, except for a couple black and navy blazers I keep in case of job interview, funeral, fancy dinner etc. Nah. 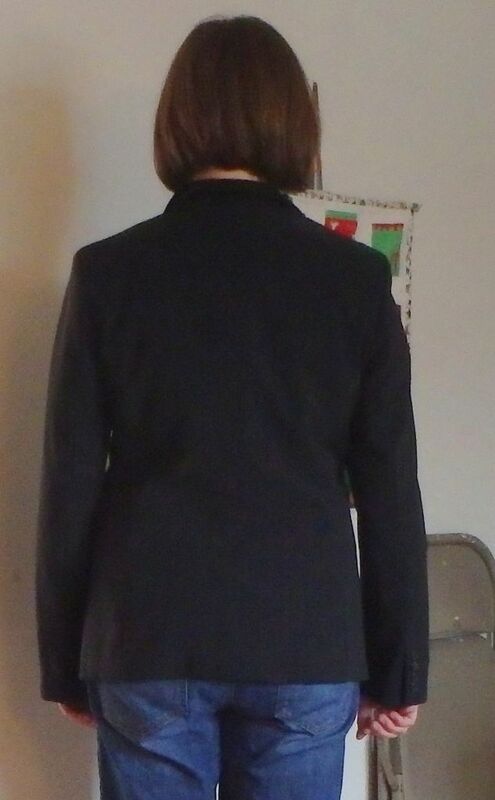 Fully lined blazers are not worth tailoring. VERY costly with mixed results. There is something a little blocky about this blazer. I vote pass. I don't think this one is worth saving, but I do totally understand the feeling when one sees such a well made garment for 99 cents! I think the shoulders are too wide for you, which makes it blocky as Angie said. I would pass it on. It is an interesting piece, but not worth the work in my opinion. I think it does look a bit dated and business like. I would look for a softer jacket to casualize. It will be more comfortable as well!